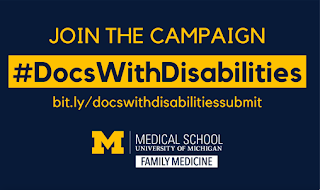 The University of Michigan Department of Family Medicine is developing a campaign to raise awareness about the number of practicing #docswithdisabilities in medicine via a social media campaign on Twitter and Instagram. The campaign will highlight various DWD (Docs with Disabilities) by name and photo. We invite you to join the campaign by contributing your story, normalizing the inclusion of DWD in the physician workforce. Using submitted photos and stories, they will create an infographic, integrating the hashtag #DocsWithDisabilities with your featured photo, quote, and short bio. The campaign will kick off the first week of January and continue until the end of May 2018.